" The Mary that we know as Catholics", is the Mother of God, because She is the Mother of Jesus the Son of God who is One with the Father, and who is also man and God. We are very fond of Our Lady because She is our refuge and our help, She was given to us at the foot of the cross to be our Mother, when Our Lord said to John: "Behold your Mother"
This humble woman who marked the transition between the Old Testament and the New Testament, when She gave her fiat to the Lord is Our Mother. "Let it be done to me according to your Word" she said to the angel Gabriel, teaching us to do the Will of God. We call Mary "Our Lady" , a title that next to "Our Lord" means a great deal of respect, and She deserves all the honours that can be given, because She is the Mother of Our Saviour, the cause of our Joy and because She is our Heavenly Mother. According to the Protoevangelium of James, a first century manuscript describing the early events in the life of Jesus of Nazareth, Mary was pledged to service in the Jewish Temple at Jerusalem in fulfillment of a pledge made by her parents to an angel who visited them prior to her conception. She went into service at the Temple at the age of three and served there for ten years. She took a vow of life-long chastity while in Temple service. At the age of thirteen, she was sent home by the Temple priests to be betrothed to Joseph, a Nazarean carpenter. 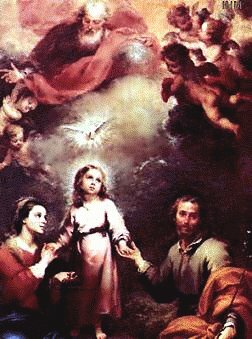 The Blessed Virgin Mary conceived Jesus by the Power of the Holy Spirit (Luke 1:26-35). She remained a virgin after the birth of Jesus, because this is the unique dignity of Mary for being the Mother of God. She was involved in the life of Jesus throughout His ministry. She cared for Him as an infant (Matt 1:18 - 2:23); she looked for Him in the Temple when she thought He was lost (Luke 2:41-49); she cared for Him through adolescence (Luke 2:51-52); she interceded with Him at the wedding at Cana (John 2:2-5); she worried about Him as He began His ministry (Matt 13:46); she was at His cross when He was crucified (John 19:25-26); and she prayed with the other followers of Jesus after His ascension (Acts 1:14). Mary's role at Cana illustrates the importance in which she is held by her Son. Mary, God's humble servant, noticed that the wedding no longer had any wine and brought this to the attention of her Son. He responded to her admonition, "They have no wine. "(John 2:3) by willingly doing something miraculous. Her last recorded words in the Bible, "Do whatever he tells you." (John 2:5) signify her full expectation that her Son would do the miraculous by causing nature to bend to His will. She was and is full of faith in Him; she was His first disciple. It is during Mary's presence at the Cross that her future role in the development of Christianity is unveiled. "When Jesus saw his mother and the disciple there whom he loved, he said to his mother, 'Woman, behold your son.' Then he said to the disciple, `Behold, your mother. '"(John 19:26). The use of the word "woman" in this context is unusual. Jesus, like any loving Jewish son of His time, would address His mother with more affection than the use of "woman" seems to indicate. However, Jesus is quoted at the crucufixion and at the wedding at Cana as referring to His mother as "woman". This is likely a reference to the Genesis description of the savior, "I will put enmity between you and the woman, and between your offspring and hers; he will strike your head, and you will strike his heel" (Gen 3:15). In this statement, God promises humanity salvation through the woman of Genesis; her offspring will crush the head of the serpent. This is Jesus' way of reminding all that He is the salvation promised by His Father. He reminds us that God always keeps His covenant. By giving His mother to the disciple at the Cross, she becomes the Mother of all Jesus' followers and the Mother to His Church. It is in this role that she has occasionally appeared to the pious throughout history.